OPTICAL CONFUSION: Satan in the collapse? Please pass this on to as many people as possible. The Klingerman virus, the Muslim day of terror, Nostradamus' prophecy, the poisoned water supply, the 4,000 Jews who stayed home on Sept. 11 and the 70-year-old man who surfed the debris down 80 flights to safety--all of these are fiction. They were made up, misheard or misconstrued--sometimes out of malice, sometimes not--and circulated with haste across the world's e-mail servers in an attempt to make sense of, or assign blame for, the World Trade Center disaster. It is hardly the most dignified aspect of human behavior, but spreading rumors and hoaxes and sowing conspiracy theories are common responses to calamity. When Hurricane Andrew hit Miami in 1992, there were tales of stockpiled bodies hidden by the government to prevent public hysteria. After the Challenger explosion, people swore they had seen crew members leave the space shuttle before takeoff. We are currently seized by the same phenomenon but of an unprecedented order of magnitude. "People are looking for certainty, and they don't care where they get it," says Gary Fine, a sociology professor at Northwestern University who specializes in the study of rumors. "They would rather know something for sure, even if that thing for sure is wrong, because it provides them a sense of stability." Social scientists say three types of rumors commonly emerge following a catastrophe: wish-fulfillment rumors, bogey rumors and wedge-driving rumors. The old man's debris ride to safety is a classic wish-fulfillment rumor, as is the story that Osama bin Laden is dying of liver cancer. Bogey rumors (derived from the bogeyman) are based on fear. Poisoned reservoirs, anthrax attacks, the visage of Satan in the World Trade Center smoke and the Klingerman virus (which supposedly arrives through the mail on a sponge in a blue envelope marked "A Gift for You from the Klingerman Foundation") all play on our fear of the worst, which, to some people, is more comforting than the unknown. Wedge-driving rumors--Jews or Arabs had prior knowledge, Arab gas-station attendants were seen celebrating, and--get this--the Swiss did it to raise the price of gold--arise from anger and hate. Self-described serious-minded people may laugh at all this. 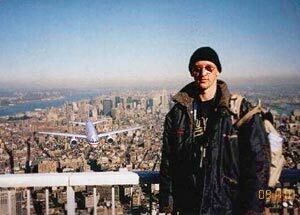 Particularly strange is a widely circulated photo of a young man on the World Trade Center observation deck, a plane looming just yards behind and below him. It has clearly been manipulated (the man is wearing a parka and ski hat on what was an 81[degrees] day, plus the observation deck wasn't open yet on the morning of Sept. 11). Still, people have latched onto it, even creating a backstory that the camera was found in the rubble. "To you and me, that fellow standing on the observation deck is clearly fake," says Barbara Mikkelson, an amateur folklorist who runs the suddenly inundated urban-legend website Snopes2.com. "But a huge number of people thought it was real. And they were just horrified... Sometimes I'm tempted to say something like, 'Uh, for the morons in the room,' but my e-mail list snaps me back. Some intelligent folks are deeply disturbed by this." The problem with dismissing all the World Trade Center rumors is that not all of them are fiction. Some stories that initially seemed ludicrous--a downtown Starbucks charged frantic rescue workers $130 for three cases of bottled water the day of the disaster, George Bush was targeted for assassination at the G-8 summit, a pair of bound and severed hands was found near ground zero--turned out to be true. The pace of information delivery has also created serious misunderstandings. The rumor that Sept. 22 would be a "Muslim day of terror" and that Boston was specifically targeted came from a good source: John Ashcroft. The Attorney General even called the mayor of Boston and the acting Governor of Massachusetts to warn them of possible attacks. The following day, the FBI rescinded the warning, saying it was based on bad intelligence. If you missed a beat in the news cycle, you were misinformed. As long as the news keeps happening quickly and a sense of helplessness looms over the culture, the rumors will keep coming. People need to forward something. Normally they pass along jokes, but few are prepared to cross the World Trade Center humor line. Instead, they swap stories, and the outrageousness of the attack has led many to believe that anything is possible.